Praise God! 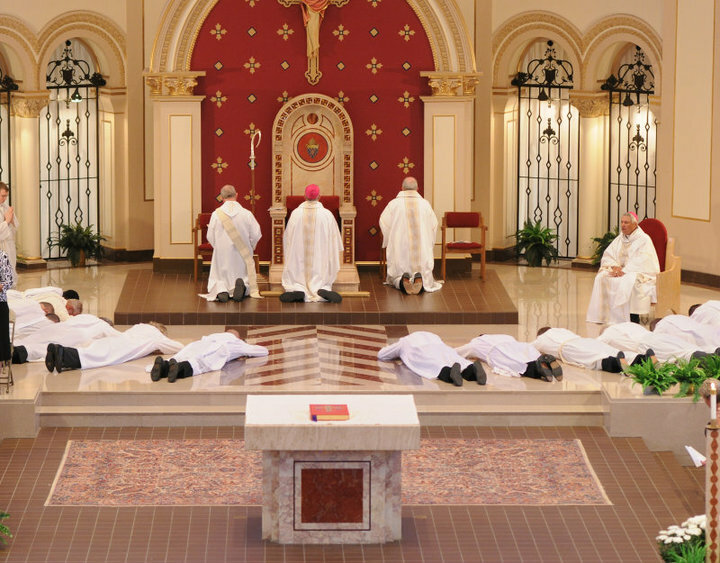 There are now 13 newly ordained deacons for the Diocese of Des Moines. They were ordained Saturday morning at the Cathedral. It was a beautiful liturgy. I was filled with joy. When my husband was ordained, I felt, for the most part, relief. A little joy. But my overriding emotion was relief. Relief that I hadn’t managed to get in the way of his vocation to the deaconate. It is hard to believe that it will be four years on August 19th. Anyway, it was a great day. I wish I had a camera to get a picture of all the deacons, their wives, and the priests who were lined up on the sidewalk as we waited to process into the Cathedral. It was quite a sight to behold in down town Des Moines. What a witness! Unfortunately, cameras and purses are not liturgical items so we had to leave them at home. Congratulations to the thirteen men from community 13. This entry was posted in Catholic Church, Clergy, Sacraments and tagged Catholic Clergy, Deaconate, Ordination. Bookmark the permalink.